We're "out of season" on IRAs. Unlike the tax-time crunch, few people are spending time thinking about their Individual Retirement Accounts. And that makes it the perfect time to remind you how to avoid some expensive IRA mistakes. 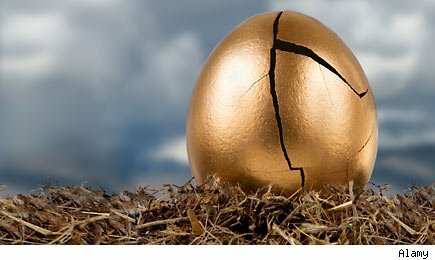 IRA expert Ed Slott (www.IRAHelp.com) says the most costly mistakes you can make with your IRA do not come from investment losses. Instead, they are the taxes and penalties that arise when you make mistakes as a result of your own ignorance -- or the wrong advice you might receive at your financial institution. It's up to you to know the rules. Most people are aware that if you withdraw money from a traditional, tax-deductible IRA before age 59½, you are subject not only to ordinary income taxes, but a 10% federal tax penalty. That's designed to keep your savings growing over the years. But these days, many desperate people are taking money out of retirement accounts early. Many are unaware that this is a very costly move. Others decide just to move their accounts to a new financial firm. But, depending on how you handle the move, you could also be vulnerable to taxes and penalties. A rollover occurs when you move an account from one custodian to another, but instead of having the account transferred directly from custodian to custodian, you take the money in the form of a check, and then open a new account. That's considered a rollover. You must move the money to a new custodian within 60 days -- or it will be treated as a withdrawal, and you'll pay applicable taxes and a penalty, if you're under age 59½. And you are allowed only one rollover per year. Do a second one, and you'll pay those taxes and penalties. Solution:Have the money transferred directly from custodian to custodian, without taking a check. You can do unlimited account transfers in a year, but only one rollover. If you will need to withdraw for education, move the 401(k) funds to your IRA (if your plan allows, typically if you've lost your job) and withdraw from the IRA to pay education bills penalty-free. The education exception applies only to distributions from IRAs, not from company plans. If you really need the money, and if your company plan allows, you can "borrow" from your 40l(k). But if you lose your job and haven't returned the money, it will count as a withdrawal. Whether you're taking cash out early, or taking the annual mandatory withdrawals required in the year you reach age 70½, set aside the cash to pay the taxes when your next tax return is due. Otherwise you'll get caught in a vicious cycle, needing to withdraw more to pay taxes next year. When you do a rollover, instead of a direct transfer from a company plan, the custodian of your original account is required to withhold 20% for taxes. You can file to get the withholding back next year if you've truly rolled the account into another IRA. But that's money that won't be working for you. So, again, do a direct custodian-to-custodian transfer, which requires no withholding. Many people think you can withdraw from an IRA penalty-free in the year you reach age 59½. Wrong. You must actually be 59½ to avoid penalties! So count 183 days from your last birthday before taking a withdrawal! And a final bit of IRA advice from Ed Slott, one that could save you a lot of money in taxes in the future: Consider a Roth IRA conversion now! Slott notes that it's been a universal "rule" not to pay taxes before you must. However, we are facing potentially huge tax increases in the years ahead. If you convert from a traditional IRA to a Roth IRA, you will owe taxes next April -- at this year's marginal tax rates, which are near the lowest in recent history. All future gains will come out tax-free. And there will be no required mandatory withdrawals, so if you don't actually need the money during your retirement years, it can go to your heirs, who can keep it growing tax-free. Of course, you'll need money outside your IRA to pay the taxes, or you lose some of the benefits of the conversion. But you're taking money that is earning only 0.25% to pay taxes that would surely be higher in the future. Not a bad trade. And that's the Savage Truth.